Paper Butterflies is utterly heart-breaking. It’s so compelling and beautifully written, but it hurts to read. Like a physical stab in the heart. It’s claustrophobic and terrifying- is there an idea more chilling than telling the truth and not being believed? To hide something because you know how far fetched and unlikely it seems, so suffer the constant, crushing repercussions of your secret, then to have that silence used as proof that your story is a lie? The story follows June from her young childhood to early adult years, moving between the "Before" and the "After". We begin when she is around 10- her mother has died in the recent past and her dad has married a new wife, Kathleen. June’s step-mom is abusive. She plays vindictive mind games, she hurts and humiliates, she shames and verbally tortures, aided by her accomplice Megan, her biological daughter. June’s completely clueless father refuses to see what is right in front of his eyes, berating June for not trying hard enough, for being distant when all Kathleen has ever done is try to love her. June is black, like her late mom, which only increases her sense of 'otherness' in her white family, and in her mostly white school. She feels like a cuckoo at home and a target at school. Her torture from her stepmother and classmates seems never ending- she endured it with such tragic, silent dignity. I don’t want to romanticise her silence and imply it was the right thing to do, but she is so brave. So brave and so alone. As readers, as adults, as people who have not experienced this torture, it is easy to say that she should’ve spoken out; but the fear. The fear is shown so thoroughly and totally by the author- it rubs off on the reader. That suffocating, claustrophobic *dread* is profound and visceral. That fear of making the first step, of breaking the cycle. She tries so hard and so frequently to tell, early on. We see her repeatedly promise to speak up, only to lose faith in adult after adult. We say it’s brave to stand up and speak out, and of course it is, but June is a separate kind of brave- the kind that suffers unspeakable torment and hardship and persecution but refuses to be broken. Paper Butterflies is about how all those safeguards that we think protect us; family, teachers, grown-ups, society, authority in general, can fail a person so entirely. It's about the treacherous flexibility of truth, the gaps between how events can unfold and how they are perceived from the outside. Kathleen is a master of manipulation; she has perfected her craft and her persona in a Gone Girl like way. The book does remind us though to consider the cycle of violence and abuse; it reminds us that nobody is born evil. June is asked to consider- what made Kathleen this way? What must she have endured in her life to manifest this suffering on you? How must Megan have felt about her part in this? Who is really to blame? The only reprieve she gets is in the form of her secret friend, Blister, and his eccentric family. The secret talisman that she can hide from her violated home, that will protect her for only as long as it is hidden. I loved Blister. I loved his carefree happiness, his trust in his own identity. He was utterly authentic and his mad, enormous Weasley-ish family was absolutely gorgeous. I don’t know what June would have done without them. Blister ensures that this book has a light in it; a sliver of hope to hold on to. I don’t think I have ever felt more impotent, wounded rage on behalf of a character before. I’d worked out quite early what had become of adult June, but the route to that ending pretty much destroyed me. The unfairness. The injustice. That tiny sliver of hope just amplified the wrongness of the whole thing. This book is a testament to the craftsmanship and the skill of its incredible author. She forces us to walk the tiny, sliver of a line between hope and despair and we are so close to the despair that it will haunt us forever. I loved Seed, Paper Butterflies, though difficult and ruinous and devastating, is also an incredible, incredible novel. The YA book prize has, since its inception, never shied away from recognising and platforming tough novels, novels that other, more traditional kids' book prizes might discount as being too traumatic, gratuitous or bleak, regardless of the strength of the message or the quality of the writing. 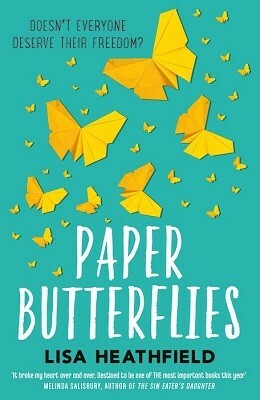 I am so glad the YA Book Prize included Paper Butterflies on its shortlist, it's absolutely essential. If the winner was decided on the strength of a readers' reaction, PB would win every time.